I ended up giving the Meili Anti Cellulite Cups 3.5/5 stars. I was excited to try them out because it’s a little different than the typical cellulite products I test like creams, lotions, and oils. I definitely like these anti cellulite cups but it’s an intense love/hate relationship. To be frank, the cupping totally hurts and is painful. I will say it does get easier once you do it more but my goodness it hurts. Definitely start out with LOTS of lubricant (gel, cream, lotion, oil) and use the small cup for starters. This one is easier to navigate and is less intense due to a lighter suction. Start with a minute or two in one area and work your way up to the ideal 5-10 minutes per area. I literally lasted 15 seconds the first time I tried it. But I also went big and used the large cup and didn’t have a ton of lotion on. Literally slather to the area up with whatever you’re using first! I’m definitely happy with the results and especially for such an affordable price. You can really feel your circulation and blood flowing. Your skin will get red almost immediately. 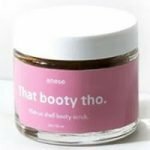 It helped tone up my legs and booty and smoothed out the texture and appearance of my skin. It also really helped soothe some of my aches and pains. I love using this as a body massager for this very reason because it feels great. I used it on my lower back and upper booty/hips and it helped ease my muscle pain. It’s not a miracle worker but I’m happy with it! The biggest thing is bearing with the pain because my goodness does it hurt! So if you’re up for the challenge, I think you might really get some good out of these anti cellulite massaging cups! The Meili Anti Cellulite Cups are silicone cups. They are extra-thick and durable but also pliable and soft to help mold to your body. The cups have a rubbery feel to them. So the application process is quite the adventure and learning process. It’s also pretty/very painful! But pain levels vary per person and your tolerance, skin type, etc. It does come with a little instruction sheet but it took some trial and error to finally figure it out, but maybe that’s just me! The biggest tip I can give you is to use PLENTY of lubricant beforehand. You can use whatever you’d like such as gel, oil, cream, lotion, soap or any other light lubricant. First, lube up whichever body parts you’d like to start with. Next, you’re going to place the silicone cup on your skin and gently squeeze the cup to create a vacuum/suction on your skin. Then, gently loosen your hand. Once you loosen your grip, the cup will take its natural shape again and it will make the cup suction onto your skin while drawing your skin up into the cup. After that, you’re going to take both hands and move the cup smoothly along your skin in straight lines, circles, and zig zags. Massage each problem area for 5-10 minutes every time. Once you’re done, lift the edge of the cup and gently remove the cup from your skin. For best results it says to use daily but you can also do every other day or a few days per week to start. The whole process took a while to get used to. I definitely had redness, bruising, and PAIN. It hurts SO badly when I massage my thighs, but mine are incredibly tight and sore to begin with so that may make my experience even more intense. I suggest starting with the smaller cup because it will create less of a suction and the grip won’t be as tight/uncomfortable. And make sure you’re using plenty of lubricant; this will help the cup slide easier on your skin and not pull as much. Another tip is to keep the cup moving at all times. Don’t just let the cup sit on your skin or that’s how you’ll end up with those traditional, evil looking cupping bruises. Once you’re done massaging, just rinse the cups with water (or soapy water if you prefer) and dry them off. They’re very easy to clean. The only drying time involved is with any oil/cream/lotion you use while you’re cupping your problem areas. So it just depends on what you use! Luckily, the silicone cups don’t have a smell to them! There aren’t really any short term results. It’s mostly just pain at first! They say the pain and bruising lasts about 1-2 weeks. I think it depends on the person, though. This product isn’t for the faint of heart, though. You definitely have to be a tough cookie to deal with the initial pain. But it does get better the longer you use them. The long term results are much better. It feels like it helped increase blood flow and circulation. I noticed my legs and bum look and feel a bit more toned and firm. I had some reduction in the appearance of my cellulite. I also really like this cupping method for my achy muscles and as a body massager. I have arthritis in my lower back, so my back is usually hurting and sore. It makes my legs and booty super tight and painful, too. I feel like it really helps ease some of my back and leg pain and it feels great as a massager. The cups are made out of high-grade hypoallergenic silicone rubber. The Meili Anti Cellulite Cups are $8.99 on Amazon. You get 2 silicone cups, a smaller one and a larger one. They also have an option for the 2 cups and a cellulite massager for $12.99. The $8.99 set seems like a good value to me. It’s so inexpensive for an effective product. I don’t believe Meili has an actual website, I think they strictly sell on Amazon. That being said I also don’t see any type of guarantee listed on their actual sales page. At least the product is pretty inexpensive so you’re not out a ton of money. You may be able to return it if you don’t like it, depending on Amazon’s return policy. To buy Meili Anti Cellulite Cups, click here. Notable Ingredients Cups are made out of high-grade hypoallergenic silicone.